Below is a listing of some businesses that would be of particular interest for visitors to town. 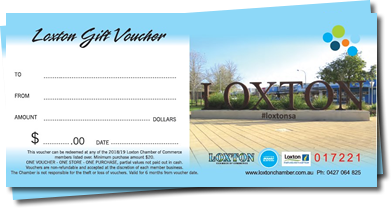 For a more comprehensive listing, please visit Loxton Chamber of Commerce. Gourmet produce available from La Villa,The Country Bakehouse, Banrock Station Wine & Wetland Centre and Loxton Visitor Information Centre. Browse our extensive range of beautiful gifts including fair trade products, homewares and fresh flowers. Take time out in our new coffee ship while enjoying the relaxing music. Supermarket offering groceries, bakery products and much more. Extensive range of local grain fed meats, specializing in our own smoked ham and Kassler. Fresh fish every Wednesday. Jachmann Apple Cider and apple products are hand grown, pruned and picked. Outlets include Loxton Hotel, Loxton Club, Company & George Tapas Bar, Loxton Visitor Information Centre, The Village, Loxton and Nuts about Fruit Renmark. La Villa offers a gorgeous range of home decor, gifts and homewares. Spoil yourself with stylish jewellery, bags and scarves. Choose from an extensive range of Maxwell & Williams kitchenware. Open: Mon-Fri 8.30m-5pm, Sat 8.30am-2pm. Extended trading during December. Ice, recycling depot, scrap metal and stock feed. Cnr Badcoe Rd & Starcevich Rd, Loxton. Newspapers, magazines, stationery, greeting cards, giftware, including handbags, candles, jewellery and scarfs. SA Lotteries Agency. Open Mon-Fri 8am-5.30pm, Sat 8am-12 noon, Sun 9am-12 noon. Pharmacy. Sleep Apnoea, Diabetes (NDSS),Vitamins and AMCAL products. Open Mon-Fri 9am-5.30pm, Sat 9am-12 noon. Freshly squeezed Orchard Crush fruit juices. Factory direct sales. Various local outlets. Tours by appointment. Computer sales and repairs, printers, mobile phones and accessories, TV's, antennas and Electronics. Jaycar Electronics agent, technical service and support. Extensive range of sports clothing, footwear and equipment. Great range of men’s fashions, plus all the top brands in guys, girls and kids surf wear. Open Mon-Fri 9am-5.30pm, Sat 9am-12 noon. Call in for all your photographic needs, including printing from all digital devices, same day enlargements, local postcards, frames and albums.Large range of ethical giftware. Huge selection of fashion, sports and work shoes for the whole family. The friendly family store with fashions for everyone, plus manchester and much more. Fuel outlet, sales of new Holden, Mitsubishi and used vehicles. Servicing of all makes and models, genuine and aftermarket parts. Auto bay, manual bays, vacuum and fragrance bays, car detailing service available. Water-wise car wash using recycled water. Open 24 hours, 7 days a week. Mogas Service Station, LPG and exchange 9kg gas cylinders. Open Mon-Fri 8am-6pm, Sat 8am-12 noon. Closed Sun & public holidays. Specialising in bespoke website development and graphic design services, That's Graphic prides itself on working in partnership with clients every step of the way.